Temple food – purity in itself! I have been so busy of late that there is not even enough time for reminiscence for the events of the past few days. However, 29th of July this year was more memorable than it normally is. We celebrated my daughter Kriti’s and my dear friend Rajeev’s birthday in office with a small havan. What better way to wish someone on their birthday than with the blessings of the almighty. It was such a refreshing experience to surrender yourself to God for those few hours. What followed next was the prashad. My mother and Rajeev’s wife prepared some great halwa which reminded me of the Kada Prashad you get at a Gurudwara in Mumbai. This then got me thinking about the role of food in our religious ceremonies. Right from celebrating festivals, births, marriage or mourning a loss – any event in our lives is incomplete without food. Can you imagine the number of rites, rituals and food ceremonies that are performed to appease and please the 33 million gods and goddesses we speak about in Hindu mythology! No visit to the temple is complete without an offering on behalf of the devotee and the giving of prasad on behalf of the priest. The offering made by devotees to god is known as ‘Prasada’ in Sanskrit, and primarily consists of rice, vegetables, sweets and fruits. It is usual in a Hindu temple to prepare foods that are first offered to the deities and left in their presence for a while which thereafter becomes a sanctified Prasad. The prasad is then distributed to devotees. Each temple has its own special prasad established over a long period of time and the quantities cooked daily at the popular temples are enormous. These temples often have huge dining areas to serve food to pilgrims. Thanks to the nature of my work I get the opportunity to travel and have had the joy of visiting some great temples in India and sampling theprashad that they offer to us humble devotees. Years ago when I visited the Golden Temple and tasted the Kada Prasahad over there I felt a kind of divine intervention. The halwa was so tasty and had been made with the simplest recipe ever. The taste probably had everything to do with the fact that it was made and served with purity and love. It is said that it was given to the soldiers before they embarked on their journey to the battlefield. The goodness of the kada prashad should ensure a sweet victory. Another famous temple is the Siddhivinayak temple in Mumbai. On any given Tuesday the temple is flooded with devotees who come here to attend the magnificient aarti that takes place around 5am. After the prayers what makes you more spiritual is the prasad of modak and sugar coated coconut pieces that you get at the exit gates. Jagannath temple in Puri undoubtedly has the most fascinating cooking procedure. The kitchen area is magnanimous and everything from cutting to cooking to serving is done on a humungous scale. Even the procedure of cooking the food is unique – Vessels are placed one of top of the other and interestingly the top vessel is cooked first. Rice and vegetables are cooked together this way. The secret to this method of cooking has never been revealed and remains a mystery to worshippers across the country till date. The entire process of preparing and distributing the prasadamhas been carried out so efficiently and with such great dedication and devotion for years now. The food prepared in the Jagannath Puri temple feeds hundreds of tourists, locals and pilgrims every day. Another interesting place I visited last year was the Govindev temple in Imphal where I was blessed with the sight of thousands of people dressed in white – worshipers are encouraged to visit the temple in white dhotis or kurta-payjamafor men and white sari or salwar-kameez for women. The wonderful thing about the bhog in Manipur uses fresh herbs and spices. Chillies – both green and red and tomatoes are used in liberal quantities unlike in other where they are shunned. While it is difficult to choose a favorite from the entire bhog but one which touched my heart was the fruitrasa – a piquant sweet and sour dish of haibong (sour fruit) served over plain rice. I was pleasantly surprised as I felt a burst of flavours as I had the first bite of this divine and different bhog. Hinduism believes in eating right kind of food since whatever we eat influences the three qualities of Sattva, Rajas andTamas. Satvic food promotes longevity, heath, purity, strength and cheerfulness. Rajsic causes pain, grief and disease and Tamsic promotes slothfulness, cruelty and evil nature. Hence the prasad in most temples and most religious rituals is usually vegetarian. However this was not the case with the Kali Bari Mandir back when I had a chance to visit it. The temple used to serve lamb. I was a bit surprised by this, but then I found out that it’s because goats were sacrificed to the Gods as part of a religious ritual. Now however the sacrifices have been stopped, but the Kali Bari mandir still continues to have an extremely interesting prasad story. There are no restrictions when it comes to theprasad and bhog offered in this age old temple – it could be anything from chocolates to wafers to fruits and even cola. Anything that is offered to the goddess by her devotees is then given back as prasad. The idea behind this is to pass on the message that all the worshippers are treated equally in the eyes of god. Preparing food for the bhog is considered an honour and undertaken with loving tenderness. Preparation for cookingbhog is as important as the actual process of cooking and there are strict rules that have to be observed. Every temple has its traditions but there are some general guidelines that are followed. Bathing before entering the kitchen is mandatory. The kitchen has to be washed and wiped dry before preparing bhog. The Brahmin cooks wearing a freshly washed single piece of clothing tied around the body loosely to facilitate movement. Most temples kitchens discourage whistle cooking and often are required to wear a thin mask covering the mouth and nose to maintain purity and hygiene. These and several other rules must be observed during the process of making, offering and distributing the prasad. However the most sacramental of all these virtues is the seva bhaav that the bhakt has for God. It is believed that the taste of the bhog is as much dependent on the hand that prepares it and the emotion while cooking as on the ingredients used. The crux of a bhog is based on the bhaav with which it is made. Maybe this is why temple food is always good to eat. It doesn’t just fulfill your hunger but also satisfies something more within you. It is food for the soul not the stomach! 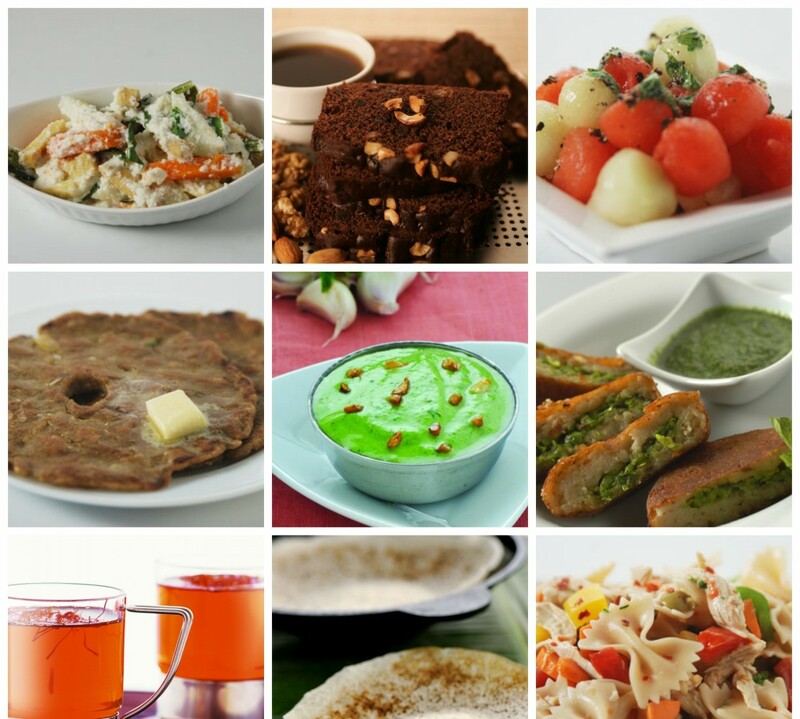 Try some of these recipes before the festive pooja season begins!